It’s a little tough for me to think super clearly right now; I just might have pushed myself a bit too hard last week—Thanksgiving time here in the US and also making some more preparations for my trip later in December— since I seem to have either come down with some kind of sickness for the first time in several years or the fatigue has finally caught up with me. Fortunately I did have some time to write about what I intend to do with grids, so let’s talk about it anyway! In this style of battle, all the blue characters are in your control and all the red characters are enemies. You can move your characters in any order one at a time and they move within a certain number of square spaces, e.g. the one riding a horse can move farther than the ones on foot. When you’re within range to battle an enemy, heal an ally, etc., you can do that. After you’ve moved everybody, then the computer takes its turn (or “phase”) and also moves its characters in any order one at a time to battle yours. Fire Emblem is one of my favorite game series, but everything about the design comes with its pros and cons. 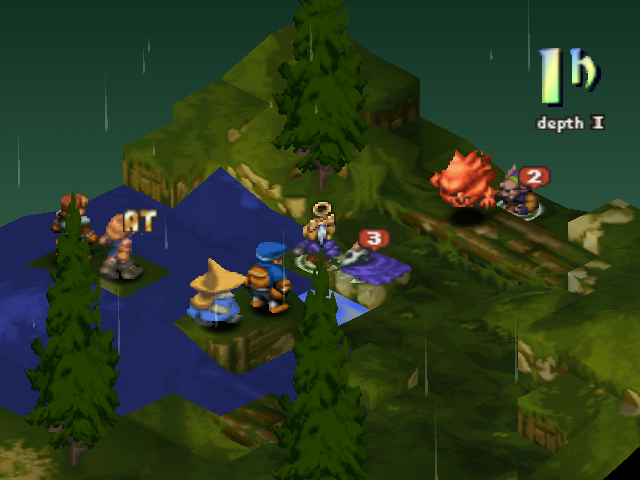 Moving each character one at a time is mentally engaging because of the needed strategy to readjust your plan after every one or two moves depending on how battles play out, but it can also feel somewhat tedious physically later in the game when you’ll be moving twelve or more characters in each phase. During your turns, almost everything goes according to plan and even in cases when you’re rolling dice (e.g. you have a 65% chance to hit the enemy), you’re told upfront what those odds are and you don’t get blindsided by anything, so it has a strong feeling of fairness; on the other hand, since you don’t get blindsided by anything during the moments when you’re in control, the game can feel a little less dynamic compared to other RPGs where your attacks might be interrupted by enemies and you have to adapt. The system of switching between your phase and the enemy phase is simple in theory and gives you maximum control over coordinating your characters’ movements and attacks, but it also comes at the expense of making sense from an in-universe standpoint. For example, a horse-riding enemy who might theoretically want to run away from your mage, who’s running on foot, can’t get away just because it’s not the rider’s phase, not because of something in the game world that would explain how this happens. Another example is that you can move your character with 3 Speed before your character with 20 Speed. 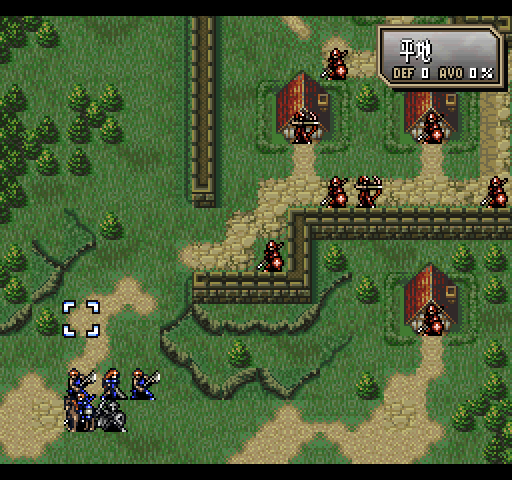 The bottom line is that there’s a reason this type of grid-based system is reserved for strategy RPGs, emphasis on the “strategy.” Just by the nature of each “player” taking their entire turn at a time, there’s not as much back-and-forth between you and the enemies, but instead you’re switching roles frequently between being the active player and the passive observer. Anyway, in this setup, characters on both your side and the enemy side act one at a time according to their Speed stats. So it could be that one of your characters moves first, then an enemy, then two of yours in a row, then four enemies in a row, then three of yours, etc. To a certain degree this makes more sense from an in-universe standpoint than the Fire Emblem style, but it still makes a lot less sense than the traditional Final Fantasy style (like, say, FF through FFX). This is because of the component of movement. Why does the character with 7 Speed get to move 5 entire spaces before the character with 6 Speed gets to move 5 entire spaces? It would be incredibly tedious if they traded off moving only one space at a time until finally the character with 7 Speed gets one extra space at the end, so we know why the developers didn’t design it that way, but that doesn’t explain how it works in the game universe. An upside to the FFT style of system is that there’s more of a give and take. Your plans are always being interrupted or thwarted by enemies getting in your way, which can feel a little more authentic, and you aren’t simply setting up your goals and then moving toward them with no obstacles. …but a downside is that it can also be a bit overbearing. In a Fire Emblem or Tactics Ogre style of game, at least when it’s your turn it’s really your turn because you get to move all of your characters with full control. 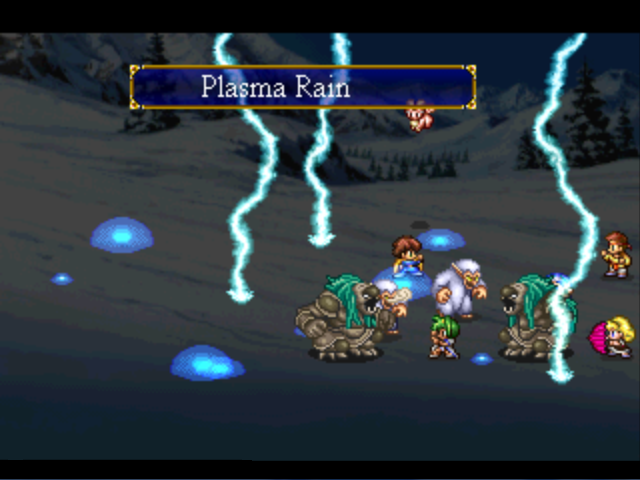 In FFT, when it’s your turn, it’s only that individual character’s turn. Even though the battle technically comes across as more realistic and dynamic, in a way it can feel slower to only be offered one character’s action menu at a time. Both of these previous styles were strategy RPGs and Dreamblazers isn’t a strategy RPG, so let’s look at one more game… This one doesn’t use an explicit grid, but it’s still one of the closest examples I can find to what I have in mind. These are two screenshots of Lunar: Eternal Blue (albeit from different versions of the game), a traditional turn-based RPG. 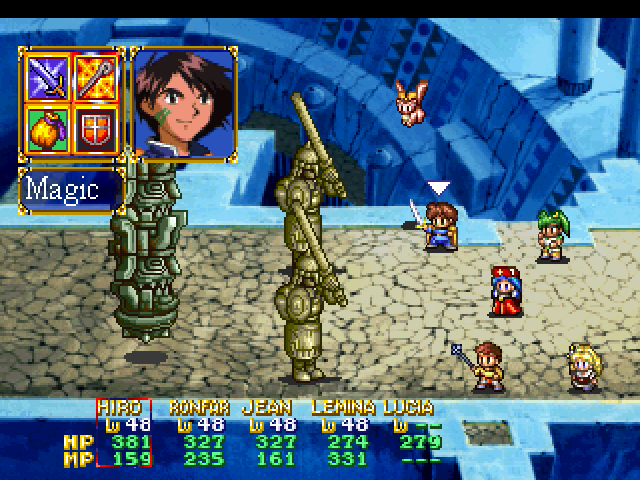 In this style of battle system, you choose actions for all of your characters and the AI chooses actions for all of its characters, then that turn (that round of combat) plays out according to each character’s Speed. If any character on either side dies, gets put to sleep, etc. before they get to take their action, then they lose their opportunity until next turn, so you try to plan in advance, but not too far in advance. These are the very fundamentals of a turn-based RPG and Lunar basically doesn’t deviate from them except that depending on which enemies you want your character to attack, they’ll move automatically across the battlefield toward whatever they’re attacking and can’t hit it until they’re close enough. In theory this sounds pretty cool to make close-range fighters and long-range magic users feel more distinct, but in practice it didn’t mean all that much (at least for the melee side of things) because generally both the heroes and enemy monsters would always be rushing toward each other on the relatively small battlefield anyway. You were always close enough to attack, so the only question left was more about keeping Lemina’s delightful self out of harm’s way. Now that I’ve constructively criticized everything, what am I going to do differently? 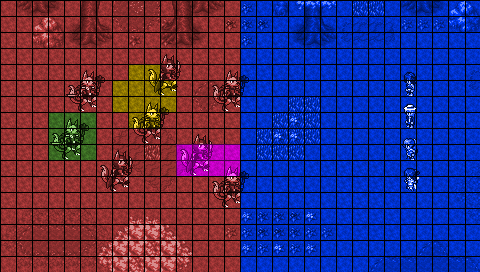 …where you can only move your characters within the blue area and the AI can only move enemies within the red area. Because characters can move extremely fast in the Dreamblazers universe, I don’t want it to ever be the case that anything is ever “too far away” to be battled even with close-range combat techniques. Let’s say you’ve targeted the green, yellow, and pink areas. 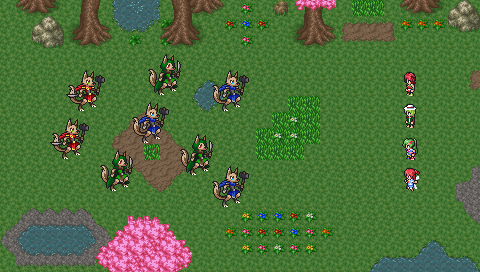 The Kobold Chief in green hasn’t moved yet and has no chance to avoid the attack because it isn’t able to move its entire body out of all of those spaces. The Kobold Rogue in pink was originally at the center of that rectangle and moved to the left, but because it’s still inside the rectangle, it also gets hit. The Kobold Rogue at the upper right part of the yellow plus used to be in the center of it and already moved up and to the right, but that’s still within range, so it gets hit… and the Kobold Warrior at the bottom of the plus also gets hit! The first benefit is making it feel like it’s possible for characters to narrowly avoid taking a hit. Of course, it’s still possible to use your pure Evasion stat to dodge a hit, but this would add a second method of artful dodging. The second benefit is making battles feel more awesome—because my intent is that it should be much less likely that your targeted enemy will dodge your attack than that an enemy you didn’t target will also step into range! Exceptions, of course, include big duel scenarios with top-level warriors involved. Kobolds themselves might be able to transcend light speed in bursts, but they’re not the fastest things around. If you ever just so happen to play as Leaf training to grow stronger with her best friend Celty, who is the fastest character in the game and has the ability to teleport on top of it, then you could certainly expect her to step out of range of your attacks more often than a very large majority of enemies. This entry was posted in Devlogs, Dreamblazers, Game Design, Game Mechanics on December 2, 2015 by JellyPaladin. It’s amazing how much more productive I get when I’m doing what I really care about: putting down all the groundwork to start watching numbers fly around in battles. More of the Miharu enemies’ moves are in place now than not. Once they’re all set up, the enemies just have to learn their moves, use them in balanced and appropriate patterns, and join forces to start battling my test party. Excitement ahead! This entry was posted in All Text, Devlogs, Dreamblazers, Game Design, Game Mechanics, Indie Development on May 26, 2014 by JellyPaladin. The first step of any project is to grossly underestimate its complexity and difficulty. I’d extend it to not only projects, but components of projects. 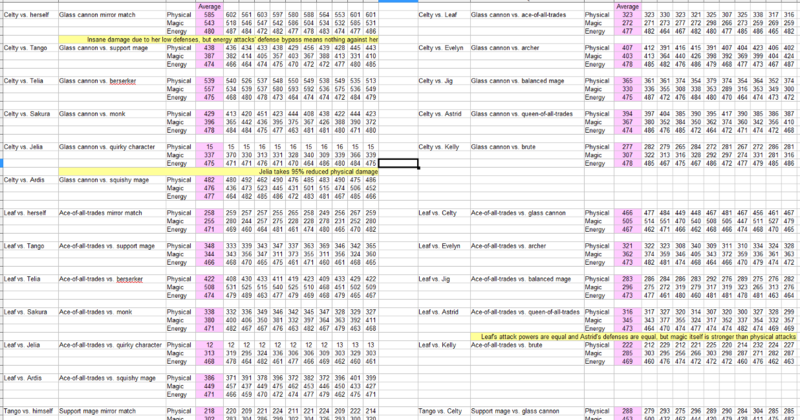 As I implemented moves in battles, one of the first steps was setting up damage formulas. 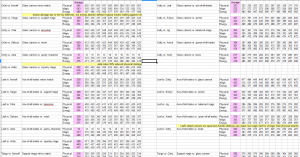 No problem, thought I; I already know what my damage formulas are, so I only need to add them in. Uh-oh. This quickly revealed that energy attacks were too powerful. They’re meant to be powerful because they bypass defenses, not because they’re inherently four times better than physical or magical attacks. I had modeled my damage formulas after the Pokémon series because there’s no RPG I’m more familiar with, but I had gone overboard with my changes for energy attacks. Days of testing later, you see the spreadsheet above! Even now I’m not confident that I’ve settled on a final formula, but it’s infinitely better off than before. Continuing to plug away! This entry was posted in All Text, Devlogs, Dreamblazers, Game Design, Game Mechanics, Indie Development on April 21, 2014 by JellyPaladin. Even though—no, because it’s fully optional for the player, my fashion system ranks high as one of my favorite ideas. At best guess I’d say I thought of it in late 2012 or early 2013, but in any case, it’s certainly my newest large-scale idea. One uncommon element of Dreamblazers that I’ve had in mind since at least 2010 is that equipment never becomes irrelevant; even starting equipment can be used until the end of the game. Like so many of my ideas, this was inspired by Pokémon (with a huge hat tip to The World Ends With You). The average player simply blasts through the game with their favorites, but a competitive player like me will reset twenty times until that Bulbasaur from Professor Sycamore has the right nature. I aimed to appeal to both. A casual player never needs to look at a character’s outfit—and yes, I’m calling my equipment screen the “Outfit” screen to stress this point. The serious player, though, might look at Astrid, see that all of her stats are great but none are exceptional, and give away her Trailblazer Tunic, Agility Anklet, and Enchanted Earrings to, respectively, Power-centered, Speed-centered, and Magic Power-centered characters. Could I do more, though? Could I create a middle ground between ignoring outfits and having the most intense optimization experience since Monster Hunter? Could an equipment screen be… fun? Maybe so! Each piece of clothing has at least one theme, like Cool or Playful, and piling on similar clothing gives the character a theme and boosts her Style stat. If you give her two or more themes, some have natural synergy, such as Sporty + Swimmer or Girly Girl + Princess, while others oppose each other, like Innocent + Military or Everyday + Formal, increasing or decreasing her Style. In the end I sifted through 433 theme combos and wound up with 201 ways for players to change their Style. My hope is that seeing status effect names like “Disco Knight” or “Ribbons, Lace, Angry Face” or “Sparkles and Swag” pop up as you change clothes will be as fun as opening the menu in Dragon Quest IX and seeing what myriad of new titles Stella would shower on you. This entry was posted in All Text, Devlogs, Dreamblazers, Game Design, Game Mechanics, Indie Development and tagged Dragon Quest, Monster Hunter, Pokémon, The World Ends With You on March 3, 2014 by JellyPaladin.